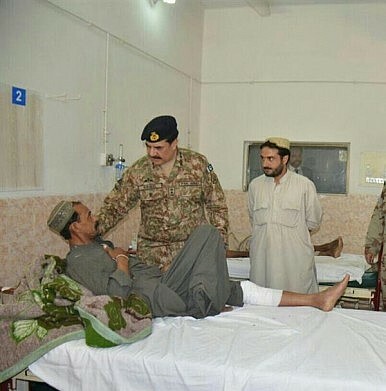 Pakistan's Chief of Army Staff Gen. Raheel Sharif visits a victim of the Quetta bombing in the hospital. Real Blood, Unsubstantiated Allegations: Was India's RAW Really Behind the Quetta Attack? This time, Balochistan’s lawyers bore the brunt of Pakistan’s inaction against terrorism, whether domestic or foreign. In January 2016, when Taliban leader Mullah Omer Mansour vowed “not [to] kill the soldier in cantonment, the lawyer in the court, and the politician in the senate and parliament,” but instead in schools, colleges, and universities which in his view, prepare them for these roles, no one believed the Taliban would keep their word. The August 8 attack on lawyers in Quetta’s military guarded Civil Hospital betrays that doubt; the Taliban proved they could keep their word. They also proved they could hit their targets wherever and whenever they want—no matter if the facilities are managed by civilians or the military. As Mansour said, the Taliban did not attack lawyers in the courts. Rather, in what came to be seen as a well-choreographed attack, the group selected a high profile target — Mr. Bilal Anwar Kasi, the president of Balochistan Bar Association — to lure lawyers to leave their chambers for the civil hospital, where a suicide bomber (apparently) stood waiting. The moment panicked mourners — lawyers in great numbers, accompanied by journalists — thronged the hospital to mourn their colleague’s death, the suicide bomber pulled the trigger. He killed himself along with 70 others while critically injuring over 100. Out of 70 dead, it is said, 55 are lawyers. One of the deadliest attacks in the recent memory of Quetta and even Pakistan, the bombing was so well-planned and gruesome that it exterminated “a generation of lawyers… [to] leave Balochistan [virtually] lawless,” at The Washington Post put it earlier this week. Although terrorist attacks in Pakistan have varied over time in their lethality, and public reaction, one thing has not changed: Islamabad’s official position. Each time a terrorist attack takes place in Pakistan, the civil and military leadership, in a rare show of agreement, declare India’s intelligence agency, the Research and Analysis Wing (RAW), to be behind the attack. Shortly after the Quetta attack, while dead bodies and limbs still lay scattered on the ground, Balochistan’s Home Minister Sarfraz Bugti came out to claim that “the administration has substantial evidence confirming RAW was stoking violence in the province by bankrolling terrorists,” as the Express Tribune put it. Chief Minister Balochistan, Sanaullah Zehri did not miss a beat either. He rushed to the media to declare that RAW planned the attack to cause panic in Balochistan. The federal government, overshadowed by country’s powerful military, quickly joined the fray to publicly declare that whenever it comes to disruption in Pakistan, RAW is to blame. “No doubt in my mind that enemies of Pakistan are after the CPEC”—the China-Pakistan Economic Corridor, a multibillion dollar Beijing-led transit project that passes through violence-ridden Balochistan—Prime Minister Nawaz Sharif declared after his meeting with country’s top civil-military leadership after the attack. Pakistan is relatively a small country of nearly 200 million people with a per capita income of roughly $1,500 per year. Yet according to Shuja Nawaz Janjua, its regular army outnumbers the regular army of the United States. The army claims the lion’s share of the budget for national defense and runs 50 corporations for profit in sectors from from cereal to cement, meat to fertilizer, and real estate to banking. It controls the world’s fastest growing nuclear arsenal and its intelligence wing, Inter-Services Intelligence (ISI), is branded at home as the world’s best—even ahead of America’s CIA and Great Britain’s MI6. However, on many occasions, ISI and the army have failed to provide adequate security to Pakistan’s own citizens. They have failed to satisfactorily answer the critics’ reservations, and failed to conclusively establish any link between a terrorist incident and the perpetrator—be it Taliban or the RAW. The attack on Quetta’s lawyers is yet another grim example where Pakistan’s intelligence is non-existent – or, if it exists, does not adequately and conclusively pinpoint the financiers, handlers, and executors of the egregious attack. Although Jamaat-ul-Ahrar, a faction of Pakistani Taliban, and the Islamic State in separate statements have claimed responsibility, neither the civilian government nor the military leadership has yet tried to verify or rebut these claims. Instead, as irresponsible and preposterous as it may sound, officials both in Balochistan and Islamabad were quick to point fingers at RAW — without any significant evidence in hand. Claiming RAW’s involvement in any capacity without building an acceptable and verifiable case against the agency adds insult to injury to the Quetta victims and their families. It also puts into question the credibility and efficacy of the government to ensure its people are safe from foreign attacks. Amidst the attack, spontaneous statements by officials from the provincial and federal governments implied that either the government was aware (as it claims) in advance as to the perpetrators, the location, and the targets of the attack or – completely to the contrary – that RAW is a nefarious but unstoppable force, able to surreptitiously plan and execute its operations at will. The latter narrative obviously undermines the reputation of ISI as the world’s best. But if the former is the case — that is, the government had a tip-off, however imprecise — the obvious question becomes: why did it not take any serious steps to stave off the planned terrorist attack? The uninterrupted and unhindered planning and execution of the attack, as is evident from post-incident reports, casts doubt on government’s claims that it was aware or had evidence of terrorists—be they Taliban or the RAW—planning and executing the attack (assuming, of course, the government is serious about preventing such attacks). And this leads one to the second question: was RAW behind the Quetta attack, trying to derail the CPEC? Indeed, Pakistani officials—both civil and military—and analysts have long decried RAW as the chief enemy of Pakistan, out to disrupt Pakistan’s peace and political and economic stability. However, when it comes to evidence, the official mantra has not gone beyond mere words. By way of contrast, he explained how India established the involvement of Lashkar-e-Taiba in the 2008 Mumbai attack. “The Indians intercepted calls from Lashkar chiefs in Pakistan directing their lieutenants in Mumbai as to how and where should they attack. They [Indians] shared that conclusive and irrefutable evidence with Americans, the British, and of course with the whole world, [all of whom] verified that information independently through their own sources,” explained Haqqani. Sure enough, days after submitting the dossiers of RAW’s involvement in Pakistan to the U.S. Secretary of State John Kerry and UN Secretary General Ban Ki-moon, Aziz admitted before the Senate Standing Committee on Foreign Affairs that the dossiers on India’s alleged involvement in terrorism in Pakistan did not contain “material evidence.” Instead of evidence, the documents only sought to establish the “pattern and narrative” of Indian involvement. While Pakistan’s government supposedly holds back “material evidence” to protect its sources, the country bleeds. Analysts question the credibility of intelligence and security agencies and their sincerity in protecting Pakistan’s citizens. A cynic would say that, for Pakistan’s military, clearly inaction against foreign and domestic terrorists has a greater return on investment than preventing attacks. Every serious step toward eradicating RAW from the national discourse is a step toward atrophying one’s own power and prestige, which neither the military nor the civil bureaucracy is ready to cede—at least not now. New Wave of Terrorist Attacks Casts Doubt on Pakistan's Security ForcesWhat Quetta Bombing Reveals About Islamic State and Pakistani TalibanWhy Pakistan Isn’t Changing Its Taliban PolicyPakistan’s Anti-Taliban Party on the Hit List AgainHow Can Islamabad Further Isolate the Pakistani Taliban?